I am sure this is a stupid question, but will they fit on pandora chains? 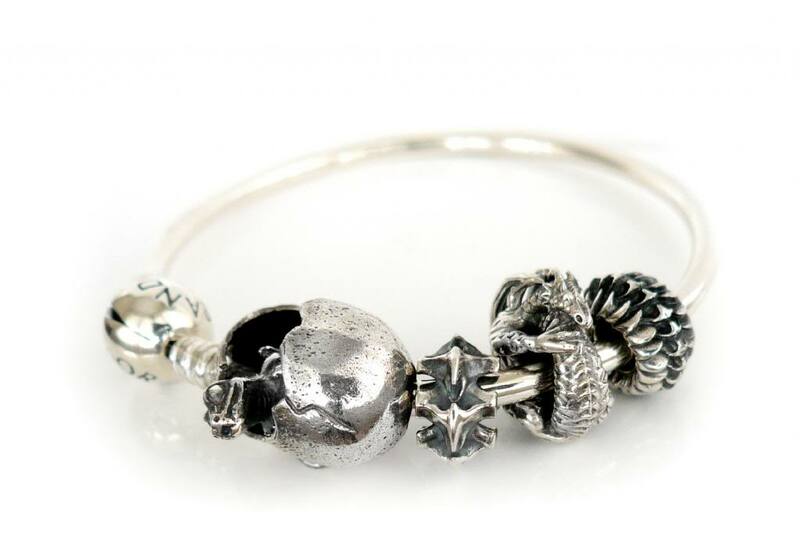 The site says most commercial, so I am assuming yes... Wouldn't really matter for me, but a friend of mine loves dragons and only has a pandora bracelet. Re: Do Faerybeads fit pandora? Depends, some fit without a problem, some can easily be adjusted to fit. At some point it had to be decided which core size would look nicer, prettier. Especially since most Faerybeads designs continue even into the core. Pursuing a Pandora size core would often mean larger beads in that case. I'll see if I can string the beads that can pass Pandora nozzles and do a picture. Thank you that would be very helpful! Beads that easily pass nozzles of Pandora, Chamilia or other large core systems are Baby Dragon and Egg, and Dragon Scales (to the far right). Tight 'fit' are the Coiling Dragon bead and the Vertebrae bead, these need a bit of balancing to guide them past the nozzles. Other dragon themes bead don't fit, but with sufficient requests the holes can be adjusted to accommodate Pandora, Chamilia and other (larger core) systems. Faerybeads Dragon beads on Pandora silver bangle: Baby Dragon and Dragon Egg, Vertebrae, Curling Dragon, Dragon Scales. Thank you very much! Now we just have to recover from all the new releases, so we can buy some! Updating this thread with new(er) dragon beads that fit, next to the ones shown above.